From Saturday 6th October to Monday 30th October 2017. Hellen toured Ghana, in West Africa in January 2017 with Creative Arts Safaris, a family company specialising in small group tours with a focus on local arts and crafts rather than the usual tourist trail. So inspirational!! The exhibition title 'RedRed' comes from a favourite traditional dish of plantain cooked in locally grown palm oil which is red, and a stew of black eyed peas cooked with tomatoes, onions, capsicum and spices. A little bit of background: The Republic of Ghana is in West Africa, situated on the Gulf of Guinea, bordered by Ivory Coast to the West, Bukina Faso to the North and Togo to the East. The largest near neighbours are Nigeria and Mali. Ghana has a population of about 27 million. 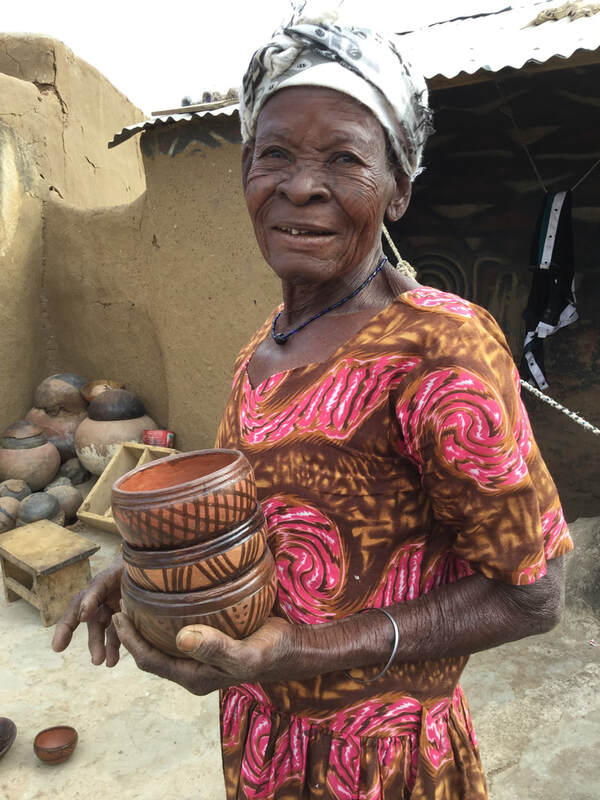 Our tour took us from the Capital, Accra on the coast to the northernmost town of Bolgatanga, visiting towns and village communities where people practice traditional crafts passed down through generations. Their skills and products are highly valued. Beads and cloth are treasured and collected, worn as status symbols – even in tropical heat, the more fabric in a garment, the higher the status. For normal wear, 2 metres of cotton cloth is used for a woman’s headdress, in the market, 4 metres of cloth is the standard length, ready cut for garments. There is a language in beads and cloth, “Cloth speaks” and “Beads speak”. Colours and shapes and the way they are put together tell a story. Each weave has a name – love, split the heart, jealous is not good, patience is good, the road to success is not an easy way. 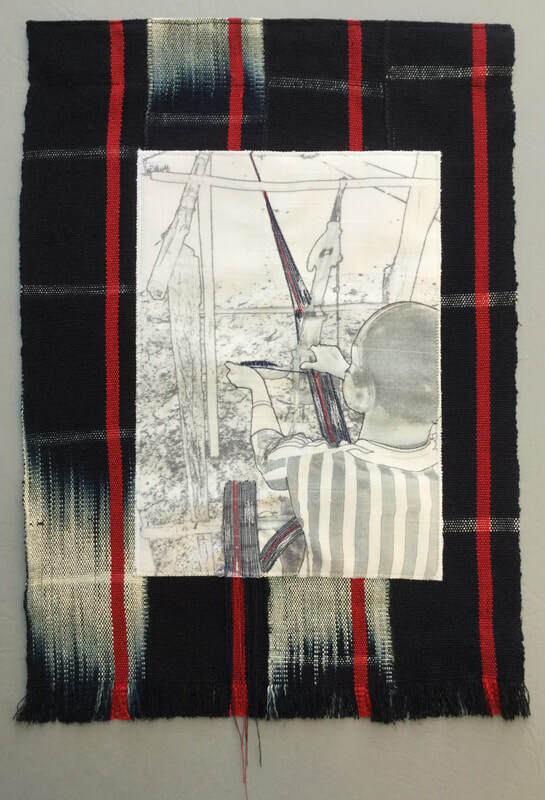 As weaves are alternated along the strip and strips stitched together a message is conveyed. Designs are created for significant events so they tell history too. Designs are created for significant events so they tell history too. Cotton is grown in Ghana and now spun mechanically in the town of Kumasi. Silk is purchased from India, rayon and Japan. Indigo dye is produced from plants that used to be wholly grown locally but now mostly bought from neighbouring countries. The stems and leaves are pounded, fibres fermented and resulting material rolled into balls to feed the dye vats. Nothing is wasted, a use is found for everything. Beads are made from recycled glass bottles. We were asked to bring empty Sapphire gin bottles for Oklah because the pale blue colour is rare and highly prized. One of the great joys for me was the opportunity to learn from the artisans and purchase cloth and beads directly from the people who made them. Our guides interpreted but on a personal level, I use my camera (the trusty iPad) as a means of communication, asking consent to take photos and showing people the pictures. It often created much laughter and joy especially with children and older people not used to technology. I introduced Apolala (said to be 85 years old) to selfies, taking pictures of the two of us together and causing much hilarity. So many shared moments to treasure! My camera is also both diary and sketchbook. The framed portraits in the exhibition are of people I found inspiring. A series of small photos printed on canvas are of Hands, working, making, creating. Initially, I had thought of making a wall of hands but in the end preferred to arrange the hands with the portraits and textiles. For the textiles, I have manipulated the photos to a very simple form, printed them on fabric (which was an adventure in itself!) and used machine stitching to emphasise the artisan and their craft. Some of these are stitched on to cloth they were making, others on to wax print cloth which is the traditional local cloth purchesed from the market. The selvedges are deliberately left, as they are worn by the people, showing the authenticity of the cloth. 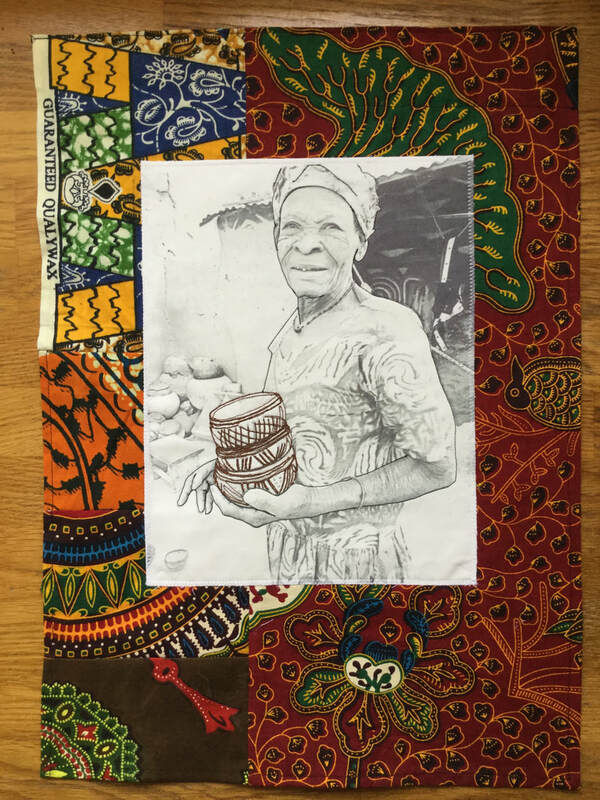 The simplicity of this exhibition is a deliberate attempt to reflect the first impressions of Ghanaian village life and its artisans, the focus on the person, the hands and the work. The exhibition includes a slide show that provides a little more insight into the life and conditions and the work being created. Yet I know there is a vast complexity underlying what we can see, of social structure, tradition and culture, skills passed through generations from fathers to sons, mothers to daughters. There is a sense of ancient history. Always so much more to learn! I hope a little of all this comes through my work to share with visitors to the gallery.